For Fairtrade Fortnight 2014, primary school pupils in Rotherham Metropolitan Borough are being invited to design a poster which reflects the principals of the Fairtrade movement. Ken Wyatt, of Fairtrade Rotherham, points out that there are plenty of ideas for the pupils to focus on for the subject of their poster: there are well over 200 Fairtrade products available in the UK ranging from beverages, dry foodstuffs including yummy chocolate , sports goods, clothing, wines, fresh fruits and flowers….the list goes on. 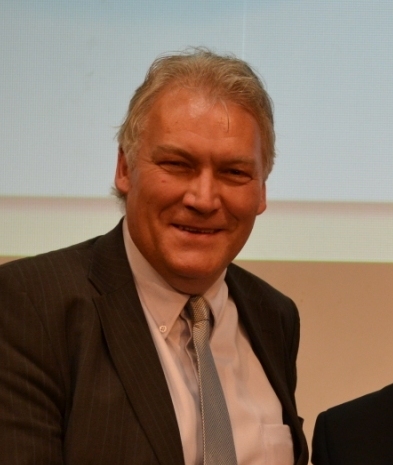 There is an emphasis on the relationships between producers and consumers; sustainable farming; decent working conditions for people with no exploitation of child labour and supporting communities to maintain their own well being. Posters need to be returned to Ken Wyatt c/o Rotherham Town Hall before Easter for judging. 1st 2nd & 3rd prizes will be awarded along with certificates for those whose posters are highly commended. A presentation evening will be held for the winners, parents & staff in May 2014. The Mayor of Rotherham will award the prizes. 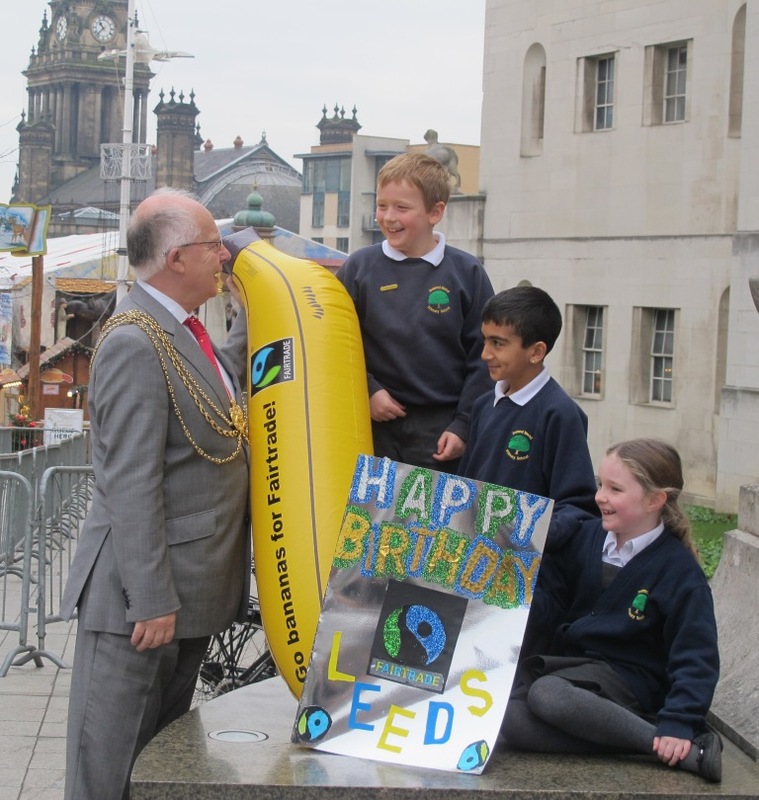 Leeds Lord Mayor Tom Murray and school children from Ireland Wood Primary school launched a very special Birthday card competition today. 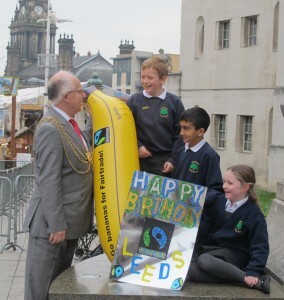 February 2014 marks 10 years of Leeds’ status as a Fairtrade City and all Leeds school children are invited to design a Birthday card to celebrate this great achievement. Birthday party celebrations planned include a ‘Fairtrade Bake off’ for interested adults and cafes, a T shirt design competition for youth groups and of course a Birthday Party, with a Fairtrade banana farmer, at the Civic Hall on March 7th. “The Council is very committed to Fairtrade and we look forward to seeing all the Birthday card entries and tasting all that Fairtrade cake” said the Lord Mayor. Schools in the Leeds City Council area that would like to enter the competition should click here for more details.